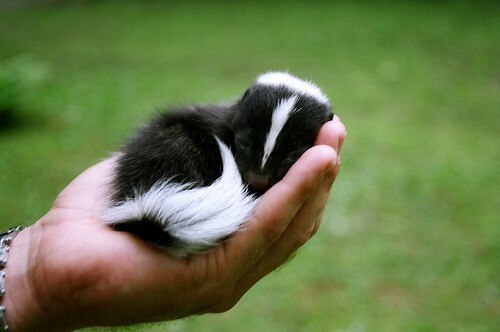 Baby skunks are simply adorable. They are itty-bitty, so fluffy, and you can hold them in the palm of your hands. (Well, a human hand). Isn’t this baby skunk the cutest thing you’ve ever seen? According to an article in the Daily Mail, skunks are the newest must-have pets for animal lovers who want something more unique than a cat or a dog. Apparently, keeping skunks as pet follows the craze of teacup piglets, meerkats, and pygmy hedgehogs. Baby skunks have super soft fur, and they can be house trained. Skunk breeders estimate that there are over 2,000 skunks that are being kept as domestic pets, and the demand is growing. In the United Kingdom, a baby skunk can cost up to £1,500 (or $2,368) in a pet store. Skunks are a member of the weasel family, and they can live between 10 and 20 years. They’re known to be biters when they’re little, but with consistent training, owners can stop this habit. In the United Kingdom, the Animal Welfare Act bans the removal of their scent glands, but in the United States, domesticated skunks grow “unarmed.” Their scent glands are removed when they are two to five weeks old, so owners don’t have to worry about accidental sprayings. There are rules and regulations for owning a pet skunk, though. In the US, only 17 states allow you to keep a domesticated skunk – Alabama, Florida, Iowa, Indiana, Michigan, Massachusetts, New Jersey, New Hampshire, New Mexico, Oklahoma, Ohio, Oregon, Pennsylvania, South Dakota, Wyoming, Wisconsin, and West Virginia. But just because these states allow you to have a pet skunk, it doesn’t mean keeping a skunk as a family pet is that simple. Many states have additional rules and regulations that you must follow, and some require a special permit. Owners of pet skunks have to pay careful attention to their pet. A domesticated skunk that escapes can be in grave danger. Since they don’t have their scent glands, they have no way to protect themselves in the wild. Plus, they do not have the natural instincts to forage and hunt. The biggest danger to skunks – wild and domesticated alike – is cars. Every year, more cars are responsible for the death of skunks than any other factors, like disease and rabies. In the US, you can buy pet skunks from breeders (who have a permit from the USDA’s Animal and Plant Health Inspection Service), licensed animal shelters, and special non-profit organizations. Oh, they are so cute! Don’t know if I’d want one in my house with me, though! I think this is horrible, why do we continually take advantage of animals and make them our flavor of the month pet. people can’t even take care of dogs, cats, birds, etc as can be seen by all the animals in rescue shelters. people need to treat animals with diginity and respect not as things to aquire. ummmm will they be spray you if you make them mad? I think they look too close to vermin, we’d just want to eat and chase them! My name is JC Routh and I work at a talent agency in NYC called VPE (vinnie potestivo entertainment). We are currently looking for a skunk owner that treats their pet skunk as though it were a child or loved one. A true animal lover and dedicated owner that somehow stands out or separates them from other reptile owners. The TV show will air 16 different episodes, each episode will be featuring a different pet/animal and its owner. It will be presented by Nat Geo Wild and be hosted by Beth Stern. If anyone knows someone or can suggest someone who treats their pet skunk very special better than any other person treats a normal pet Please let me know i Hope to hear back from you soon, thanks so much.